We hope lots of people will come to one of our events to visit the Walled Garden site at Llanfrechfa Grange and to see and have an opportunity to discuss the design put together by our volunteer design team. If you can’t make it however, please visit our new Garden Design page and complete our online survey (only 6 questions)! 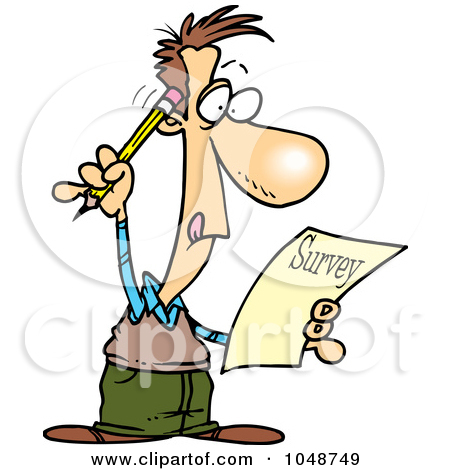 The survey will be available until the end of September, after which we will be evaluating the feedback and deciding our next steps. We recently contacted everyone on our distribution list asking if anyone who had landscape design experience or qualifications would like to get more involved in helping us translate everyone’s ideas for the Walled Garden into a design scheme. Thank you to everyone who got in touch and met with us on 26 October. We have now put together a small design team with those who took part. Over the winter the Design Team will plan a basic layout and planting scheme for the garden, e.g. the shapes and sizes of the beds, borders and lawn, and consider what facilities we need to include within the walls. We already have a number of features identified such as walkways and entrances, but we are eager to have your contributions to the plans. We will therefore be planning further events in early Spring to invite members of the public and staff from the Health Board to come along to view the layout ideas and have their say. 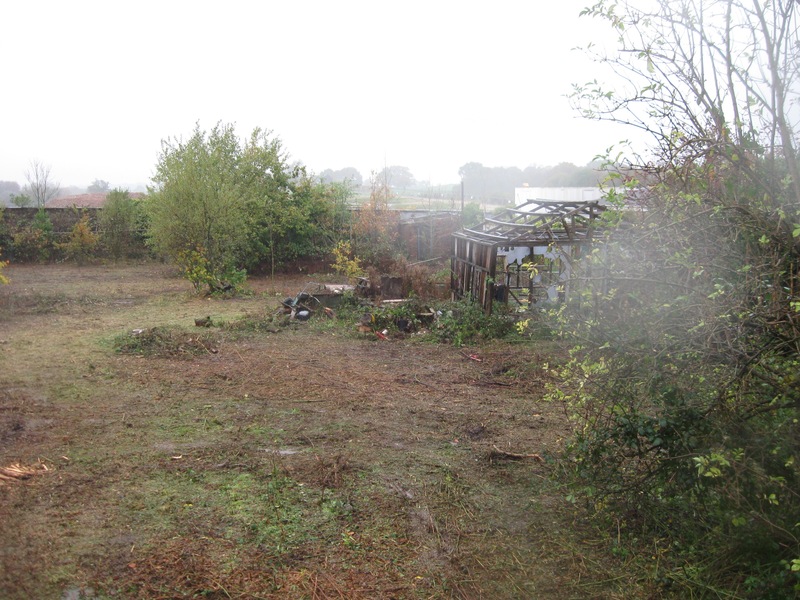 Clearing the undergrowth – Can you help? Our next steps involve clearing away the undergrowth so that we can find out if there are any old features that we should preserve and include in the design layout for the future. 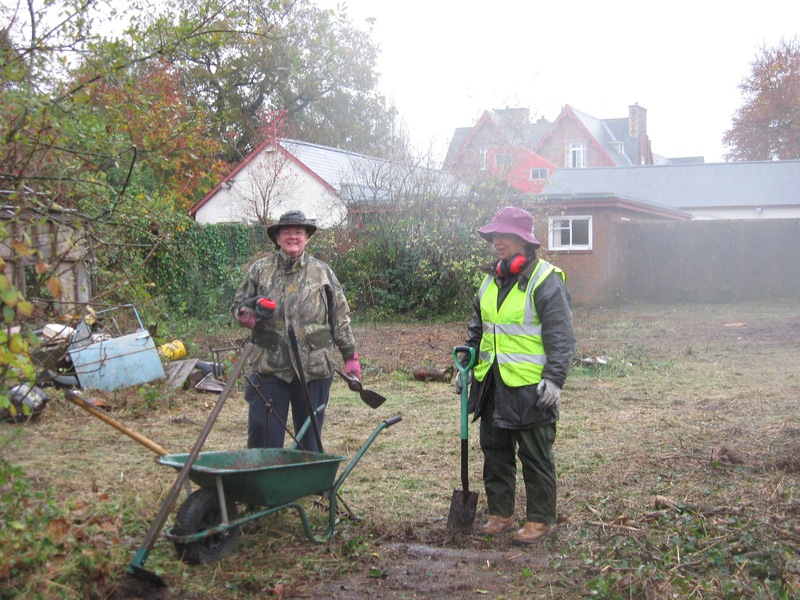 Jan Smith and Jane Nehaul at the end of a soggy November day clearing the garden. 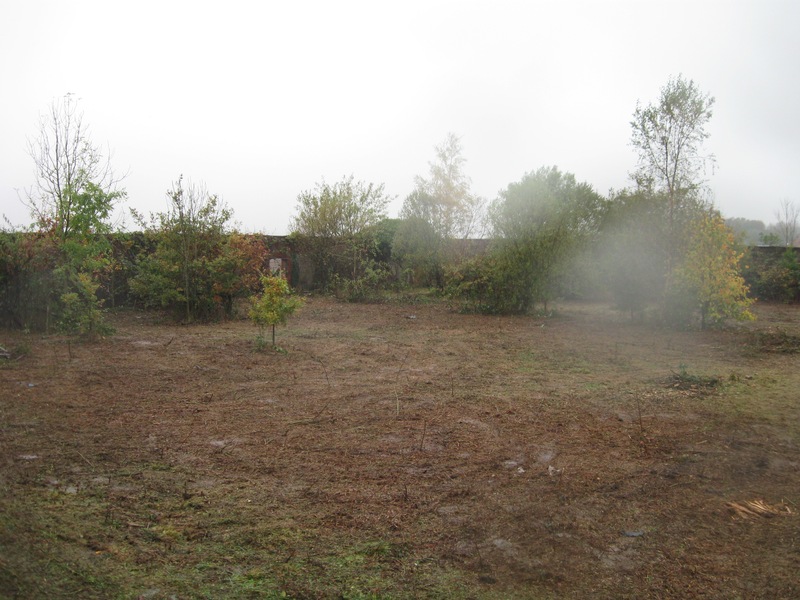 Given the derelict, overgrown and somewhat unsafe state of the garden, we felt that initial clearance should involve cutting back the bulk of the bramble and long grass, leaving a more workable environment for a more thorough clearance to follow. The Health Board’s Facilities Directorate has kindly undertaken this initial clearance using a small tractor with flail and mower attachments. Project team members Jane Nehaul and Jan Smith worked with a small group of gardeners and managed to clear much of the ground area. Visit our Gallery page to see a slideshow of before and after pictures of the garden. The garden after clearing the brambles. Now that the initial clearance is done we have a much better idea of how much more needs to be done. There are however a number of things we need to put in place to assure the Health Board that we will be working safely before we can bring volunteer groups in to undertake further work in the garden. This includes safety equipment, registering volunteers, insurance, access to toilets etc. We have penciled in three consecutive long weekends when we will be looking for volunteers to give some time to help in the garden. 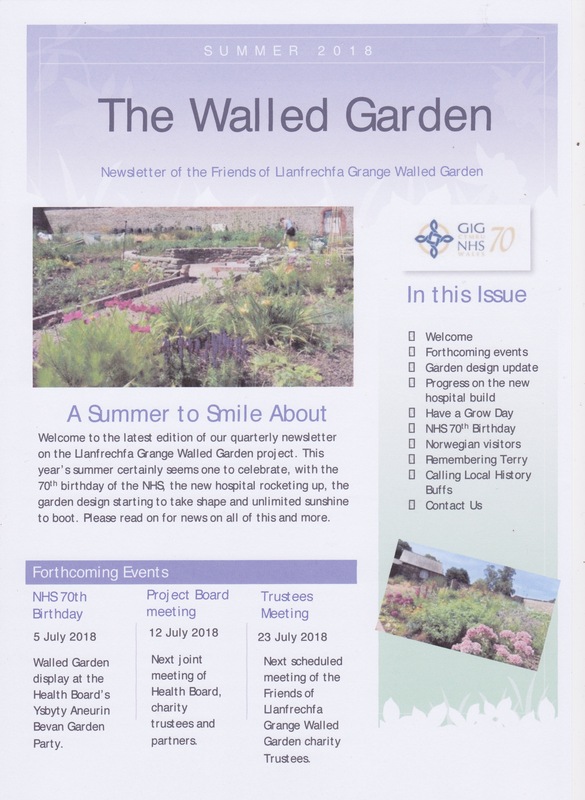 Please contact us at WalledGarden.ABB@wales.nhs.uk if you would like to get involved.